Eugene O'Neill has always been the sort of playwright who will appeal to a certain crowd, whilst putting many others off with his overwrought dialogue and turgid stylings. 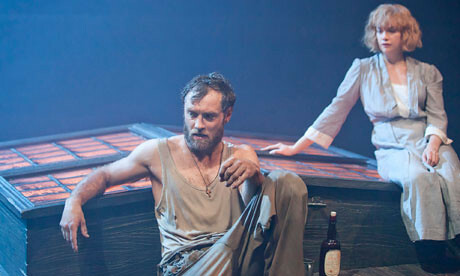 Anna Christie is a play which, at first, sounds like a typical entry from his back-catalogue; there is depressive boozing, jaded old men, rough around the edges sailors, and of course the supposedly innocent girl with a shameful past. But to dismiss this production as such would be to do yourself a grave injustice. Rob Ashford and the Donmar have crafted a superb production which manages to embrace the depth of drama, whilst highlighting the kernel of optimism and indeed throws lashings of good humour into the mix. This is a finely pitched, intense piece of theatre brimming with energy and deftly sidestepping the potential pitfalls of melodrama, one which will take even the most skeptical of theatre patrons and keep their attentions glued to the stage for the entire two and a half hour production. Indeed much of this quality can be credited to the strong cast, with particular note for the three main characters. David Hayman gives a superbly nuanced and often heart-rending performance, even if he lays his Swedish accent on a bit too thick. Ruth Wilson is accomplished in every department as the titular main role, balancing the acerbic qualities of her world-weary character with a touching sense of vulnerability, although for some her demeanour and vocal qualities might come of as a bit too textbook for such a role. But of course much of the focus will rightly go to one Jude Law, who has produced a potentially career-changing performance here, breaking free of his effete typecasting and transforming on stage into a gruff, surly sailor with such fervor and character that it is honestly difficult to believe that this is the same actor. Jude Law far exceeds anything he has ever done before, anyone who is not a fan will be after they see this. The production is notable from a technical standpoint as well. The entire stage is replaced by a mechanical platform which pivots and emulates the tossing of the sea, while dry ice pours fog in from all angles and water sprays on deck. Such is the obsession with detail of setting that reportedly the front rows of the audience in the early showings of Anna Christie were soaked. Fans of Eugene O'Neill will love the quality of the drama and the level of detail, while those who would not normally consider themselves fans will nevertheless enjoy the range of this production, a highly enthralling and well pitched production for all comers.